The job market is struggling, just as the Marine Corps undergoes a drawdown of forces that will reduce the size of the service from 202,100 Marines in 2010 to 182,100 by fall 2016. What’s a Marine to do, then? 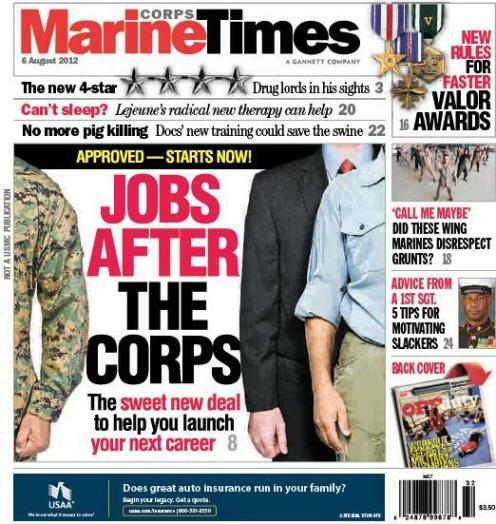 This week’s Marine Corps Times cover story explores the options that are on the table in a new transition assistance program the White House and Defense Department have planned for all troops leaving military service. It has similarities to a program the Corps rolled out earlier this year, but there are definitely differences, too. Marine and Pentagon officials are now in discussing how to make the White House plan work best for Marines, said Brig. Gen. Robert Hedelund. In March, the Corps rolled out its new Transition Readiness Seminar, which replaced the creaky Transition Assistance Management Program that had been required for 19 years. Seems like no matter how many embeds you do, you’ll never get the true flavor of the Corps huh? The controversy was beyond predictable if you were a Marine. A mom, booster, supporter or reporter not so much. But Marines get the “wrongness” of it…and political correctness can’t change a thing about that. Do us a favor Lamothe. Do a follow up on Ganjgal. Relax, Solomon. I’m well aware thousands of grunts rolled their eyes when they saw the video — it was to expected. That doesn’t mean it’s not worth a story, especially in a Marine-only publication.